We know that you love art too, which is why you've landed on our website. With that in mind, we hope to be a place where you, our customers, feel comfortable exploring all of your art interests...creating, collecting, discussing and any other pursuits you bring to us. We provide artist opportunities and classes to students of all ages. Chester County Art Center is Chester County's local art place. The Association was started in 1931 (read more about our history HERE). The Center was built in 1953. On the main level, we have two galleries (Allinson Gallery and Huston Gallery - collectively called West Chester Galleries) where we exhibit local and regional artwork 9 months of the year (September-May). The larger, Allinson Gallery typically showcases group exhibits comprised of artists of all levels who can enter both juried and non-juried shows (visit our call for artists page HERE). The smaller, Huston Gallery typically showcases solo and dual exhibitions. View our gallery hours HERE. The galleries close for the summer as we embark on our summer art program and bring a true art experience to the youth in our community. Hours during our summer months change due to a shift in focus from gallery to classes (view summer art programs HERE). We look forward to seeing you at our Creative Space for Everyone. 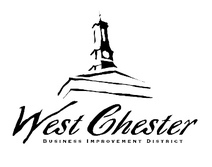 West Chester Business Improvement District (BID)- Doing Great Things.